Cryolipolisis, also known as ‘Cool Sculpting’, has been around since 2010 but with the improvements in technology, has now become one of the best ways to get rid of stubborn fat deposits from specific areas of the body like the tummy, love handles, inner & outer thighs and arms. 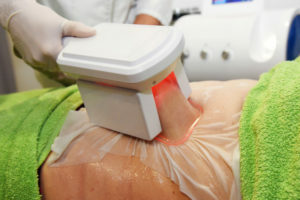 This process where fat cells are frozen now means that you can have a treatment in your lunch break, doing away with the need for expensive options such as liposuction. Forget the long recovery times requiring time off work and the thousands of dollars price tag too. But, as with all equipment used for various treatments, not all machines are made equal. At Lose it with Laser, we have an FDA approved machine. This means it has been proven to work! Don’t take a chance and spend money without the assurance that you will see a difference with each session. Each treatment can remove between 25-30% of fat in the area being treated, so up to 3 sessions may be required, spaced 4-6 weeks apart. Fat cells are extremely temperature sensitive, so when exposed to temperatures as low as -10 degrees, they get destroyed and crystallise. The surrounding tissue is unharmed, whilst the fat cells are removed by the body’s lymphatic system. ‘Before’ photos are taken and the area to be treated is marked. The amount of fat is measured using callipers and whilst laying down, a protective membrane is placed directly on the skin. The treatment cup is then positioned according to the markings. As the process commences, the skin and fat is drawn into the suction cup. This can be slightly uncomfortable as the tugging of the skin takes place. Once this part is complete, the controlled cooling process , cryolipolisis, commences. Depending on how much fat is in the area being treated, the temperature will drop to temperatures between -5 and -10 degrees Celsius and for a period of between 40 and 60 minutes. There is a numbing feeling of the skin but most people find they are able to comfortably work on a laptop, read a book or talk to a friend on their phone during the treatment. For those with a really low pain threshold , it may be advisable to take a Nurofen before the treatment. At the end of the treatment, the cups are removed and the skin is massaged so as to encourage the destroyed fat cells to be absorbed by the lymphatic system. Over the course of the next 4-6 weeks, it is recommended to drink plenty of water to enhance the process of expulsion as well as, of course, adopting a healthy diet to achieve an even better outcome. You are then free to resume your normal daily activities. With the tugging and pulling of the skin as it is drawn into the treatment cups, there may be some discomfort and for some, there may also be some bruising in the area. Also, the cooling process may result in numbing in the area which generally resolves within a few hours or possibly a few days for some. With the reduction of volume of fat in the area being treated, it is highly recommended to have at least one RF skin tightening treatment between sessions to avoid the appearance of loose skin. Where a package of 3 cryolipolisis sessions is purchased for one area, one FREE RF treatment will be included with the package.